Destiny fat burner has been formulated with passion and high quality! Everything is dosed efficaciously and effectively, no corners were cut and we have brought a world first fat burning formula with a strong synergistic and effective nootropic edge. Nootropics are categorised as "smart drugs". Alertness, focus and an enhanced mental capacity are what one can expect. With consistent mental clarity, feel good upbeat feeling and sharp thinking, you are going to be very focused and happy throughout the day, and during your workouts. DESTINY fat burner has been formulated to be taken twice per day, to ensure key fat metabolisers, fat burning and metabolism boosters are doing their work throughout the day (AM + PM). Utilising appetite suppressants to control your cravings, natural diuretics to flush out excess water and nootropics to keep you in a happy, up-beat and focused state. With added KSM-66® Ashwagandha, an "adaptogen", meaning it will help your body manage stress and aid in cortisol control. AM: 1 SCOOP - First thing in the morning on an empty stomach (preferably), or at some point before midday. If you workout in the morning use your AM scoop as your pre-workout. PM: 1 SCOOP - Second serve pre-workout, or after midday when you prefer. If you trained in the morning, use this second serve after midday where you need a pick-me-up, energy and focus. We recommend to take this 6 days per week, and take 1 day off to re-set in-case a tolerance to caffeine is built up and adrenal fatigue (not just from taking Destiny, but daily coffee and pre-workout consumption). Use Destiny fat burner 6 days on (2 servings per day 1 AM + 1 PM), with 1 day off as a re-set, which will provide a 4 week program (1 month supply - in conjunction with a healthy diet - caloric deficit - and a consistent workout program). 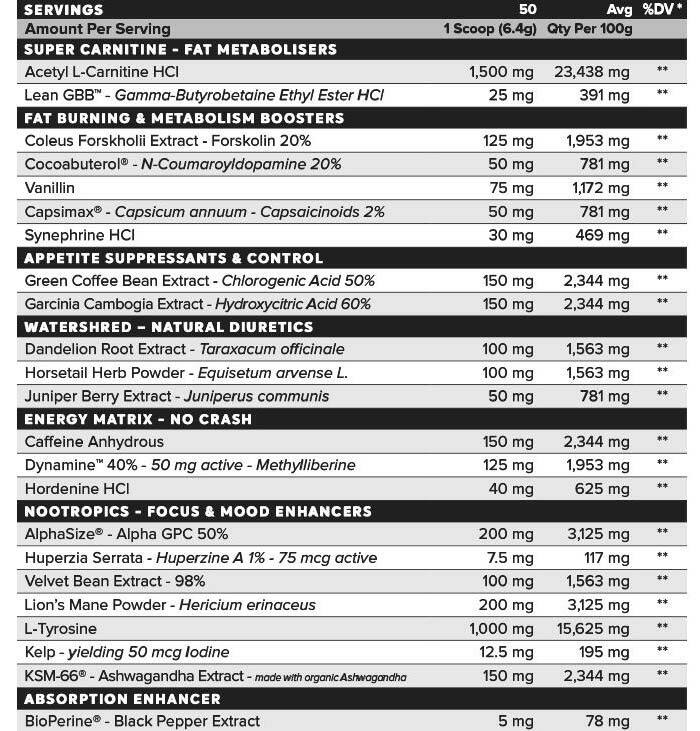 Destiny fat burner is a very effective and of the highest quality. We are all about innovation, using new, researched, effective and effectively dosed ingredients (no bread crumb ingredients or prop blends - we have nothing to hide!). We want everyone to look forward to and enjoy drinking Destiny fat burner daily. Destiny fat burner is a very effective and reliable product. All flavours taste fresh and amazing, and we want you to enjoy every single serve and to trust Destiny fat burner.